Businesses, you have exactly 8 seconds before your ideal client tunes you out. But what if I showed you how to get 3, 4, even 20 TIMES that amount of time? Come closer, because the answer is simple. 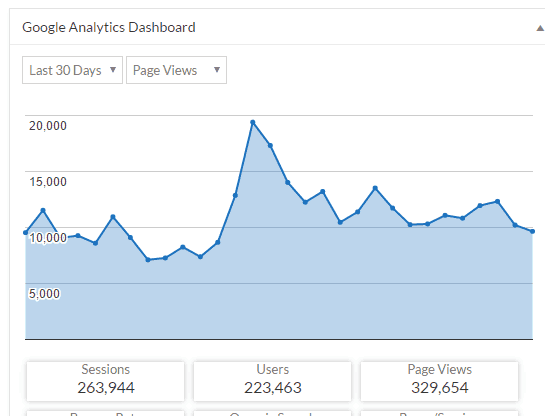 While FrugalChicken has reached nearly 350,000 unique readers in the past 30 days, the more important takeaway is that on average, those blog readers stuck around—for over 3 minutes. Even better, listeners of the FrugalChicken podcast, What The Cluck?! stuck around on average for over 20 MINUTES. Everybody knows your best buyers are influenced by word of mouth. Why not take advantage of a blog that not only has the ear of your idea client, but has it for over 20 minutes? In fact, you’d be crazy not to be hopping up and down right now. See, the times they are a-changin. Your customers are distracted. And you’re up against strong competition: every other business out there. And, boy, is FrugalChicken an influencer. Let me tell you a little about my blog. FrugalChicken is a blog devoted to helping people learn to grow organic food and raise chickens in their own backyards in just minutes a day. 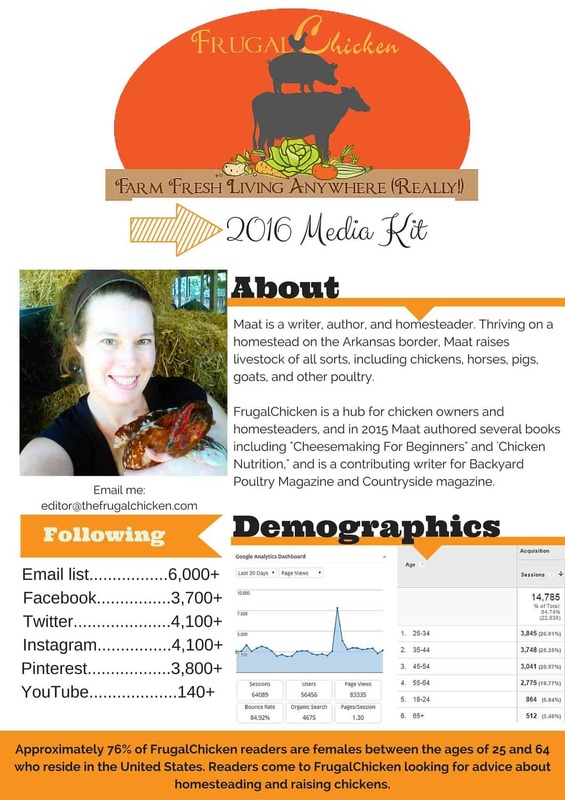 With a monthly reach of nearly 350,000 unique visitors, FrugalChicken is a growing blog—with a dedicated fan base. Of those visitors, approximately 75% are brand spanking new, and 25% are the raving fans that return again and again for chicken and backyard farming advice. It don’t get much better than that, and this is your opportunity to get your message heard. 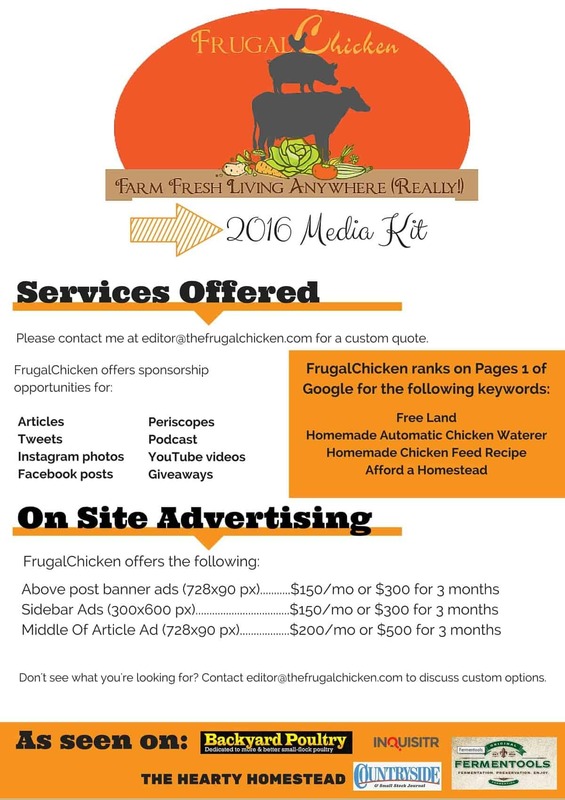 By partnering with FrugalChicken, you get access to a wide, dedicated, and engaged audience of homesteaders and backyard chicken enthusiasts. 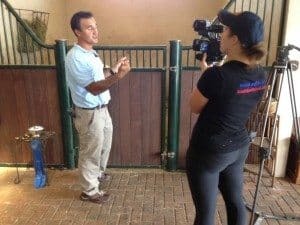 I am an authority in the field of organic living and backyard chickens that’s published in the media regularly, and this is your opportunity to introduce your products that will help my audience. For the right product, I go above and beyond the call of duty, usually including one or more of the above offerings for free if I feel the product is something my readers will truly love. Past partners have been featured in my books and online courses, so this is truly the gift that keeps on giving. Every month, the podcasts are still downloaded thousands of times regardless of release date (I still have podcasts from 6 months ago that are downloaded daily). This is evergreen content that never dies, and neither will your message. It’s best to email me at editor@thefrugalchicken.com to discuss specifics. What are other businesses saying about partnering with FrugalChicken? Mashed, 8 Vegetables You Should Be Eating, and 8 You Shouldn’t. If you feel your product is a good fit for my readers, please feel free to contact me at editor (at) thefrugalchicken.com.